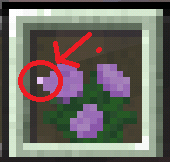 There is a white pixel seen in the peony texture sprite. This has been an issue since the peony and rose textures were tweaked. MCPE-14757 Cake texture is incorrect for some states (when partially-eaten).